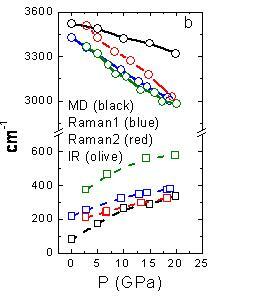 Fig 1 Comparison of MD-calculated with the measured H+/p : O2- stiffening (<500 cm-1) and the H+/p -O2- softening Raman mode (3300-3600 cm-1). Fig 2 Length correlation between the real "-" bond and the virtual ":" bond. unpublished. 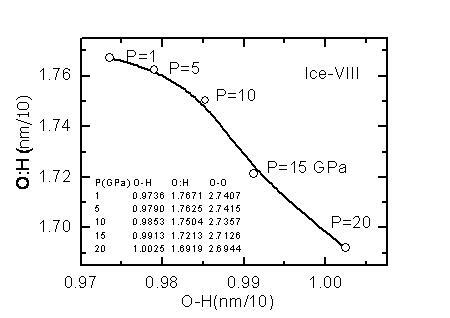 The evolution of the O-H and O:H distances in a 32- molecules unit cell of ice-VIII under pressure from 1 to 20 GPa was dynamically relaxed in constant pressure, constant enthalpy (NPH) ensemble for 30ps. The O-H and O:H lengths were taken average of the structures of the last 10ps (20,000 steps).